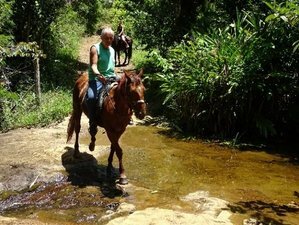 Discover the region of Itacaré on horseback, famous for its heavenly beaches and waterfalls in the Atlantic Primary Forest setting, conducive to eco and adventure tourism activities. The climate is mild all year and it makes this coast, located between Ilhéus and Itacaré, the only region of Brazil producing cocoa for more than a century. The places remain steeped in historical struggles between "the colonels" for the possession of the land at the origin of some of the most beautiful novels of Jorge Amado. You will be welcomed and supported throughout the stay by a Franco-Brazilian couple who have invested in the protection of the primary forest (25 hectares) and built an equestrian fazenda with low environmental impact including cottages immersed in nature in the heart of an area classified by UNESCO as a Biosphere of Humanity. You will be accommodated in cottages and a rustic clubhouse designed by a renowned architect from Bahia and built in 2016 in a minimum environmental impact such as the use of fallen trees taken from the farm, favored natural ventilation, warm water heating for your solar shower, and recovery in the pond of 100% of rainwater. Each double room with private bathroom and balcony is a very comfortable independent chalet, connected to the clubhouse by a footbridge, all with panoramic views of the coconut plantation, pond, and stables. The Wi-Fi is present everywhere. The night spent outside is in fully equipped chalets located near the Rio de Contas. Brand-new luxury bungalow decorated with the theme of Sertão, the arid region of Nordeste. The place is ideal for horse riders or surfers wishing to relax after their adventures of the day. All rooms are equipped with a deck offering a panoramic view over the pound, horse paddocks in the coconut plantation, and rainforest at the top. The room has a queen bed that accommodates two persons. It has an air-conditioning, Wi-Fi, shower, and towels. Luxury chalet with the ocean-inspired decor, ideal for surfers who want to stay close to the waves since it is only three kilometers away from Engenhoca Beach, one of the two best places for surfing in Itacaré, and the preferred one for surf lessons. All rooms are equipped with deck offering panoramic views over the pond, the coconut tree plantation, paddocks for horses, and rainforest. The room has two single beds that accommodate two persons. It has an air-conditioning, Wi-Fi, shower, and towels. The horses are Quarter Horse geldings crossed with the local breed (Mangalarga Marchador) and a mare Campolina (family of Marchadors) born in the region. They were selected for their calm temperament with only one requirement in mind: "anyone should be able to ride them". Their origins and their life in the meadow all year make them rustic horses with a sure foot and excellent endurance. Arrival in Ilhéus in the afternoon. Meet at the airport and transfer to the Itacaré EcoRanch fazenda (very comfortable guest house) by car (about one hour and 30 minutes' drive including a stop at Serra Grande lookout to contemplate the endless beach to Ilhéus). You will be welcome with tastings of the first glazed coconut and installation in the rooms where you will stay for four nights. If the schedule allows it (it is nighttime at 18:00), visit the three beaches near the ranch: three kilometers by car then one hour and 30 minutes' walk to go from one cove to another and take a first sea bath. Dinner and overnight will be at the eco-ranch. After a hearty breakfast at the clubhouse, you will join the stables around 08:00 to go to the Tijuipe Waterfall located two hours and 30 minutes from the ranch. The trail leads first to Campo Cheiroso and its unique landscapes then crosses a large fazenda of cacao, banana, and piaçava, crossed by several streams. You will wade through the Tijuipe River and arrive at Manã, then you use a small stretch of the BA 001 road to reach the entrance of the waterfall. After a bath and a lunch on site in the form of a picnic, the return is by the Tijuipe bridge and narrow paths in the heart of the Atlantic primary forest (Mata Atlantica) with a stop to discover another waterfall unknown to tourists. The sandy alleys of Campo Cheiroso offer fantastic opportunities for galloping before returning to the stable. Dinner and overnight will be at the eco-ranch. Departure around 08:00 for a day exploring the Rio Jeribucaçu. You will go first to the Cascade do Bom Sossego through a variety of different landscapes: coconut fields, banana trees, cassava, rubber, and palmito alternating with preserved portions of Mata Atlantica especially in the region of Riacho das Piabas. You will cross the Rio Jeribucaçu and make a short stop at the waterfall and then take a small part of the BA 001 road to reach Vila Marambaia, from where a dirt road will take you to one of the most beautiful beaches of Itacaré which is also the Rio Jeribucaçu estuary. You will have time to take a dip and laze before tasting a grilled fish in a straw hut that you have chosen beforehand before it is cooked by locals. You will return by the same route taking advantage of quiet and open dirt roads to gallop safely. You will be on time to enjoy the sunset which launches its last rays on the big trees of the forest dominating the coconut plantation. Before dinner, there will be a workshop of caipirinha, the famous Brazilian lime-based aperitif followed by, of course, its free tasting. Dinner and overnight will be at the eco-ranch. This day will be a more relaxed day for riders and their mounts before the two long stages of the following days. You will hike in the morning to discover the most beautiful views around the ranch in the form of a circuit in the varied landscapes. You will pass from one valley to another by dirt roads in the middle of family plantations and forest roads that are good for galloping. You will have an incursion into the most deserted parts of Campo Cheiroso including the inland lake and the canyon. This long circuit around the ranch takes you into the wilderness of the primary forest and deserted areas without human activity. You will feel the true nature of the origins. The end of the walk follows the jungle trail, a trip through the jungle-occupied ranch (25 hectares) that crosses the hidden Cupuaçu valley with a fording stream crossing. You will enjoy lunch at the ranch and relaxing time with nap opportunity in the hammocks. The departure will be around 15:00 by car to the village of Itacaré located 12 kilometers to discover its famous surf beaches and watch the sunset on the estuary of Rio de Contas from Ponta do Xaréu. Dinner will be at Itacaré in one of the restaurants of the lively Rua da Pituba. You will overnight at the eco-ranch. Wake up early for a departure at 07:30 at the latest to reach the village of Taboquinhas located at the edge of the Rio de Contas, 20 kilometers upstream of Itacaré. At the time of cocoa glory, this navigable part of the river was used to transport precious beans to the seaside. You will cross a large number of fazendas with various dominant activities. After the cultivation of piaçava and bananas, you will move to a first cocoa plantation that you will discover and you will admire in passing a "roda de agua" small hydraulic pump, very popular in areas without electricity. Then the trail enters the Estadual Park da Serra do Conduru created in 1997 for the conservation of an unequaled heritage of biodiversity. After crossing the hamlet of Capitão, you will enter a beautiful fazenda of cocoa and you will walk for a long time under the canopy of trees, a real happiness on days of blazing sun. The landscape is changing and so is the culture since it is mainly cassava and you will visit a "casa de farinha" which is used for cooking flour, a basic element of the traditional diet of the countryside. Picnic at the top of a hill offers a vast panorama largely covered by Mata Atlantica. There will be a change of scenery again as you will cross a cattle farm of the Nelore breed, typical of Brazil, before returning to cocoa plantations. You will visit the Villa Rosa plantation and artisanal chocolate making workshop including tastings of cocoa honey with and without cachaça. You will drive the horses to their place close to the city by visiting the cascade Usina and then join your rooms on the basis of activities of Ativa at the edge of the water. Dinner and overnight will be at Pousada Mel de Cacao. On the morning program, you can enjoy rafting rapids located one kilometer upstream of Taboquinhas, feasible for novices safely thanks to a very professional coaching. For those who are really looking for adrenaline jumping the stone from a height of seven meters and the zip line that crosses the Rio de Contas, you can enjoy those activities as they are included (optional). For those who do not wish to go rafting, there are many other options on the base such as idling on a hammock, kayaking, paddling, bathing, or wall climbing. You will pick up the horses and have lunch quickly to get back home no later than noon. The route bypasses the village of Taboquinhas in a landscape of cattle farms and cocoa plantations then join the path used the day before with its great diversity of landscapes to reach the ranch just before sunset. Dinner and overnight will be at the ranch. After a hearty breakfast, you will take the road back to the airport, according to your flight schedule. You will overnight in the plane for the return to Europe or continuation of your journey. Itacaré beaches: Concha, Resende, Tiririca, Ribeira. Departure and return by car. Jeribucaçu beach: drop off and return by car, 30 minutes' walk on a good path, lunch in a straw hut on the beach with the riders. Free morning, lunch, and afternoon with the rest of the group. Join with the rest of the group from the visit of the cocoa farm until noon, so rafting is included. Depart to Taboquinhas on day five and return to the eco-ranch on day six by taxi. Your guide, Didier and his wife Marta, are the owners of the ranch and will be with you from the first to the last day of your stay, always delighted to make you discover their farm and the surrounding area very rich in natural beauty, beaches and waterfalls. This horse riding holiday will take place in Itacare, Brazil. You will discover typical landscapes of the Itacaré region made of partially cultivated valleys surrounded by nearly untouched portions of the Atlantic Rainforest (Mata Atlantica). The trails will pass by small properties of traditional farming with plantations of coconut, banana, pineapple, clove, cocoa, hevea, manioc, and aromatic herbs among others. For other parts, you will go deep inside the rainforest and then you will be transported into the wild. You will certainly see a great variety of birds and if you are lucky, toucans, monkeys, or a sloth. The breakfasts are of the tropical type with fruit juice produced on the farm (cupuaçu, graviola, açerola, etc. ), French bread with seeds, fruits of the moment, coffee or tea, and always a small surprise concocted by the owner of the ranch. Picnic lunches are prepared at the ranch (sandwiches). Dinners will be an opportunity to discover traditional Brazilian cuisine, and especially the flavors of Bahia such as moqueca. Only the dinner at Itacaré on day five was not included in the price of the stay. If you are vegetarian, please let Itacare EcoRanch know in advance. Coconut water and sodas are offered. Alcoholic beverages (beer, wine, and caipirinha) are available as an option and payable locally. The ranch has a great selection of Bordeaux wines. Itacaré is a fantastic place and there are many other activities that Itacare EcoRanch can organize for you during your stay with them. You will not be charged for the reservation of activities as long as you are hosted at the eco-ranch. If you have no rental car, they shall take you there at a predetermined transportation fare or they shall arrange a taxi for you. They can inform the tariff of the activity upon demand as it may vary over the time. On the activities listed below, you will find people who are eco-conscious and share with Itacare EcoRanch the principles of rural and receptive tourism. If you are interested in the modern cocoa culture, understand how cocoa is grown and chocolate made, Itacara EcoRanch can recommend a good place also located in Taboquinhas. If what moves you is the ancient culture around cocoa and the fights for ground acquisition described in the famous books of Jorge Amado, Itacare EcoRanch highly recommends you to spend one day in Ilhéus to visit the house where he wrote his first book at the age of 19 and the Bataclan where "colonels" used to go when they were taking some vacation from their fazenda to spend money in the town. Main books related to this theme can be borrowed from the ranch library. Note: Best hours for birdwatching are at sunrise and sunset. Some areas of the ranch jungle are so steep that horses cannot get there. There are the most preserved ones where big endemic trees and unexpected forms of flora and fauna can be seen. The trail ends on the shore of the Burundanga river. Good shoes, closed clothing, and repellent are required for this one hour and 30 minutes' trip. It costs 50 BRL. A more radical version with an amphibian character may be organized upon demand. For those who are looking for adrenaline activities, the ideal destination is Taboquinhas and the famous rapids of Rio de Contas river of class 3 and 4, approximately 20 kilometers before the river reaches its estuary in Itacaré. Itacare EcoRanch can recommend one company that offers the best safety conditions. Once you are finished with the rapids, they will propose you the crossing of the river in the air, suspended to a zip line. There will be a lot of fun and big memories. Only three kilometers from the ranch is Engenhoca Beach where most surfing schools of Itacaré give their lessons all over the year. It is reachable on foot or by bus. Non-surfers will love the seafront trail that connects Engenhoca to Hawaizinho and Gamboa, a very beautiful and isolated beach. Follow the road BA 001 that links Ilhéus to Itacaré till you reach the parking for Hawaizinho and Engenhoca beaches. Drive for 2 kilometers more and you will find a ground road on the left of a big curve. The entrance of the ranch is 800 meters from this point, on the left, just after you pass a local church. Follow the road that links Itacaré to Ilhéus for 12 kilometers till you reach the bus stop with red tiles located in a big curve. Follow the ground road for Vila Camboinha which starts on the right after the bus stop. The entrance of the ranch is 800 meters from this point, on the left, just after you pass a local church. Please book your flight to arrive at Ilhéus Jorge Amado Airport (IOS) or Deputado Luís Eduardo Magalhães International Airport (SSA). Nearly 60 kilometers in distance, Ilhéus Jorge Amado Airport (IOS) receives on a daily basis national flights of companies like Azul, Latam, Gol, or Aviaco leaving from main cities like São Paulo, Campinas, Rio, Belo Horizonte, or Salvador. You can rent a car upon arrival or take a taxi for a one hour drive. 285 kilometers from Itacaré, Deputado Luís Eduardo Magalhães International Airport (SSA) is an international airport with daily flights coming from all over the world. From there, you can rent a car and it will take you five hours to reach Itacare EcoRanch or you can take a short flight (40 minutes) to land in Ilhéus. There is a bus every hour operated by company Rota that will stop at "Camboinha" at the entrance of the ground road, 800 meters away from the ranch entrance. Itacaré EcoRanch is a farm offering horse riding holidays located at the heart of primary Atlantic rainforest only three kilometers from beautiful beaches and surrounded by historical cacao fazendas. You can add an extra day at the eco-ranch in a full board basis accommodation for 95 EUR.